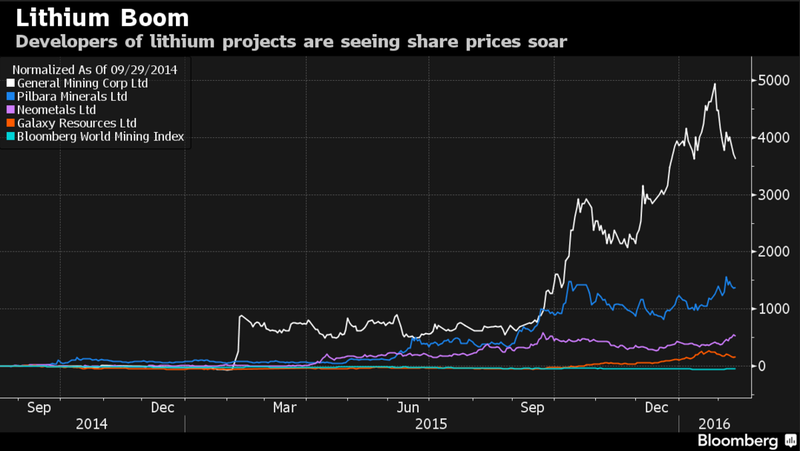 Goldman Calls Lithium The New Gasoline – Get In Before It’s Too Late Or Stay Out? A boom in expectations or the next booming industry? Strong lithium demand growth is expected by many to result in a significant supply shortage in the future. In this article series, I’m going to research the high risk and even higher potential returns associated with investing in the lithium industry. Despite the high level of action, markets have gone nearly nowhere for more than a year. Disappointing both bulls and bears, stocks are following an unclear pattern while the market pundits are weighing the possibility of a recession, and corporate earnings are on a decline. The stock market performance is becoming increasingly uncertain. Nevertheless, let me finish describing the ongoing story of doom and gloom at this point, as there is one quite under-followed niche of the market that is hiding in the commodity sector and deserves more attention. While the markets are still trying to figure out whether the recent commodity price performance might be a precursor to a new commodity boom, there is one commodity for which this has clearly been the case for quite a while already. It seems that a large part of the optimism that has fled the markets lately has found itself a shelter in the lithium industry. Even though the real potential still remains to be seen, the amount of optimism produced clearly exceeds this industrial metal’s production level. It is called “the new gasoline” by Goldman Sachs, and even “the world’s hottest commodity” by The Economist. The reason why the metal is expected to experience a boom is the surging demand for lithium-ion batteries. 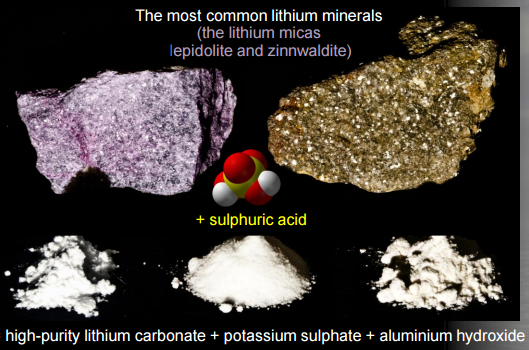 Lithium carbonate and lithium hydroxide are the two main components that are used in the production of cathode materials for batteries (despite the metal having many different uses, the bullish thesis is focusing on this particular industry). Can lithium’s role in battery production be replaced by another material? Speaking of the nearest 1-3 years, the answer is a clear “no” as the metal is currently the best combination of low-weight and high energy density, not to mention the costs associated with switching the technology should a material capable of replacing lithium be found shortly. The metal also has a reasonable cost profile which, however, might change in the coming years. Since 2000, the share of rechargeable batteries has grown from 4 percent to approximately 27 percent of the total lithium consumption, according to European Lithium. Source: Investor Presentationof Lithium Australia NL (2015). It is hard to deny that early investors’ reaction often tends to exaggerate the real potential of the new fast-growing industries (as well as the implication or popularity of a particular technology, with 3D printing being a clear example). Nevertheless, it’s even more difficult to deny that the demand for lithium is surging. Source: InvestorPresentationof Western Lithium USA Corp. (WLCDF) (2016). 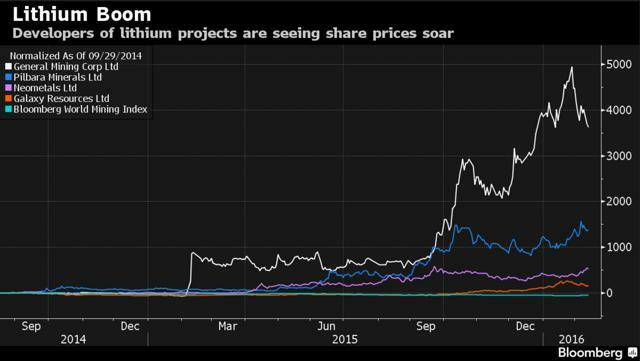 Meanwhile, there is no clear benchmark for the price of lithium as its price is reaching record volatility levels. Instead of being traded as an ordinary commodity, the metal is mainly priced on a contract basis. In addition, it is primarily supplied through an oligopoly of three major producers that have been responsible for handling most of the supply for decades. Nevertheless, the number of companies announcing new lithium mining projects has been strongly increasing of late. Reasons for that might be expressed in the increasing demand for electric vehicles and electric storage systems. The ongoing technological enhancement of portable electronics is another contributor to the bullish thesis. It can be argued that the mentioned catalysts have been there for years. While this is true, the much less-known yet crucial fact is that the current supply of lithium is already lagging behind the demand growth to a certain extent. 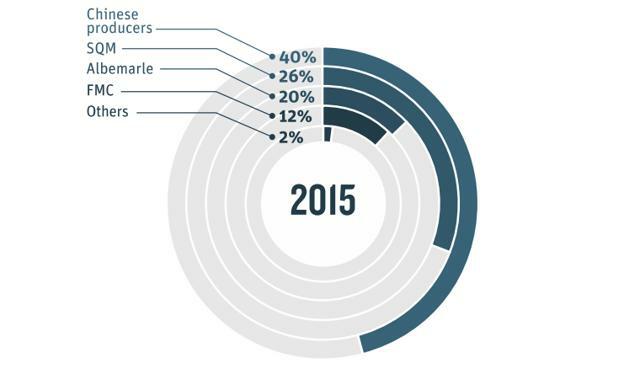 Source: InvestorPresentationof Lithium Australia NL (2015). “The upstream material – lithium carbonate was in short supply in the fourth quarter of 2015 with soaring prices. Global lithium carbonate output increased by 12.3% year on year to 202,800 tons in 2015 and is expected to arrive at 244,200 tons in 2016, 288,900 tons in 2017, and 341,000 tons in 2018, a rise of 20.4%, 18.3%, and 18.4% from a year ago, respectively. According to MarketsandMarkets, the global lithium market is expected to reach $5.87 billion by 2020 at a CAGR of 13.22% between 2015 and 2020. 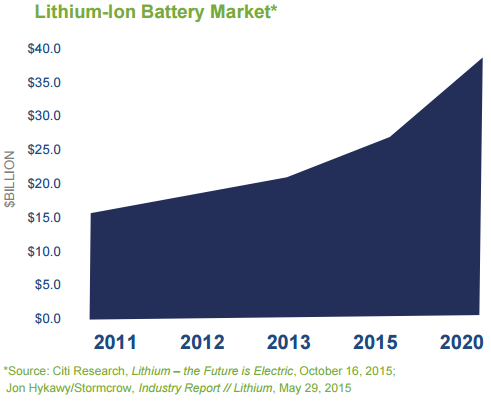 Citi Research projects the global lithium battery market to be $40 billion by 2020. 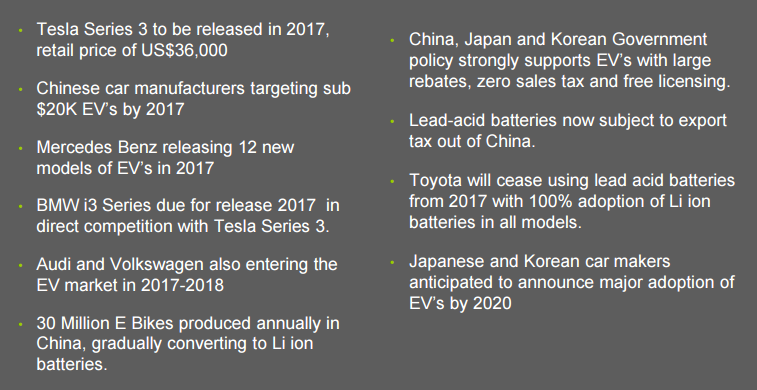 Here’s a brief list of upcoming catalysts for the lithium market. 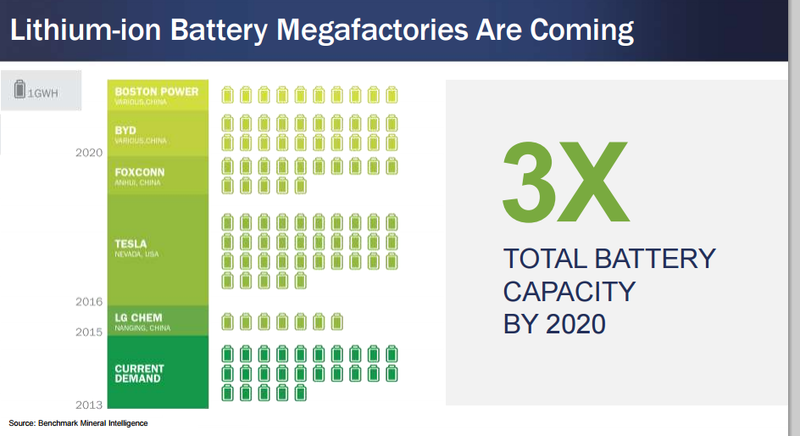 Of particular note is the extent to which the words like “Mega-” or “Gigafactory” are being highlighted when the companies are describing the upcoming industry catalysts. The stronger the optimism and excitement surrounding the industry are, the larger the potential for the early investors, as it is always on Wall Street. Source: InvestorPresentationof Western Lithium (2015). Source: InvestorPresentationof Pilbara Minerals (2015). The positive expectations are mainly driven by Tesla’s (NASDAQ:TSLA) Gigafactory initiative and a strong growth in the energy storage market, which is strongly driven by the global shift toward renewable energy. In addition, auto brands are quite bullish on the electric vehicle industry, higher production in which shall be a strong driver of lithium demand over the next few years. There are opinions (1, 2, 3) that Elon Musk might be too optimistic regarding Tesla’s capability of supplying the required amount of lithium, graphite and cobalt. Nonetheless, even if the company manages to accomplish that (while still raising the price of the commodity), the global demand will experience numerous different sources of catalysts. Daimler’s (OTCPK:DDAIY) recently announced plans of spending $500 million on electric-car battery factory that is planned to triple its production capacity for battery packs are another example. Once again, of note is the use of words in the next two corporate slides elaborating on this subject. The current market sentiment clearly demonstrates the over-excitement, more of which shall arrive as soon as the broad market learns of the possibilities the lithium-exposed companies might represent. Even though the business conditions can later prove to be worse than they are expected to be, there is a high possibility of a sharp, expectation-based bull market in lithium-exposed stocks. Currently, only three producers account for the majority of the global supply. However, despite gradually increasing their revenue exposure to the metal, the largest players are only experiencing a partial gain from the industry boom. Facing headwinds from the commodity sector, shares of SQM (NYSE:SQM), Albemarle (NYSE:ALB) and FMC (NYSE:FMC) have been underperforming many lithium-exposed companies of late. Even though the largest producers might not become the ultimate growth stocks of the lithium industry during the next bull market, they might prove to be much safer investments – these companies are old and solid while most outperforming lithium stocks, which are primarily small-cap stocks spiking on new project announcements and sliding on continuous share dilution and debt issuance, are quite volatile and face large business risks. If the valuations decrease further, the three titans will become much more attractive when the commodity cycle reverses. With plans of expanding lithium production, this oligopoly might be a good addition to a long-term investors’ watch list. I’m aiming to describe the companies in my next article. LCE– Lithium carbonate. An inorganic compound, the lithium salt of carbonate with the formula Li2CO3. Li2O – Lithium oxide or lithia. An inorganic chemical compound. Lithium oxide is formed along with small amounts of lithium peroxide when lithium metal is burned in the air and combines with oxygen. Lithium hydroxide (LiOH) – Inorganic compound. A white hygroscopic crystalline material. Soluble in water and slightly soluble in ethanol, as well as the weakest base among the alkali metal hydroxides. Commercially available in anhydrous form and as the monohydrate (LiOH.H2O), both of which are strong bases. This section of the article highlights the key information related to four lithium-exposed stocks that are traded on U.S. exchanges and might be of interest to investors who are currently weighing the risk/reward of betting on this industry. The article is planned to start a series focusing on the lithium industry and be updated as I’m researching the topic. It is planned to conclude with a buy rating for certain stock/stocks, but will not necessarily do so as I’m remaining quite skeptical on the long-term growth prospects of the related stocks due to an extraordinary amount of noise surrounding the data – overly optimistic articles pumping particular stocks and research reports from institutions I cannot find any information on are rather concerning. Current lithium revenues accounted for $223 million in 2015, up 8% since 2014, which accounted for 12.9% of total company’s revenues in 2015 (higher by 25.67 percent year over year). Projects in Australia, Canada and Argentina. Mt Cattlin (Australia): 16 Mt at 1.08% Li2O and 5.7 Mlbs Ta2O5 – lithium and tantalum hard rock mining operations being recommissioned – production is expected to start by the end of Q1. According to the latest filings, first shipment of concentrate is expected by July 2016. James Bay, Quebec (Canada): 23 Mt at 1.2% Li2O – lithium hard rock development – targeting to commence work on DFS this year. Potential of obtaining exposure to North American markets in the future. Sal de Vida (Argentina): 1.1 Mt LCE, 4.2 Mt KCI – Lithium and potash brine project. It is located in the so-called lithium triangle – located in the intersection of Chile, Argentina and Bolivia – this region accounts for nearly 60% of global lithium production. The company has a quite well reputation in the Asian markets. In October, 2015, Galaxy Resources entered into a sales and distribution contract with Mitsubishi (OTCPK:MSBHY), one of the largest traders of lithium products in the world. The company has no long-term debt and a quite competent management. For a detailed research report by Canaccord Genuity, please see here. 8,000+ acre flagship lithium brine project, located in Clayton Valley, Nevada, which contains an NI 43-101 inferred resource of 816,000 LCE. Collaboration with large technology companies POSCO (NYSE:PKX) andTenova Bateman. The recently-appointed CEO (25 years of experience – executive positions at Rio Tinto (NYSE:RIO), BHP Billiton (NYSE:BHP), Newmont (NYSE:NEM), and Lithium One) has previously negotiated Lithium One’s joint venture with LG, GS Caltex and KORES on the Sal de Vida lithium brine and potash project in Argentina before executing the 2012 sale of the company for over $100 million. On September 15, 2015, Pure Energy entered into a conditional agreement with Tesla to supply it with lithium hydroxide for a period of five years. The company’s Clayton Valley Project is located only 3.5 hours away from the future largest battery factory. One of the few brine resources in North America. A development-stage mining company engaged in the identification, acquisition, exploration and development of mineral properties located in Mexico. Primarily focusing on becoming a large-scale supplier to the lithium-ion battery market in North America. A completed PFS indicates possibility of a per annum production of up to 35,000 tons of battery-grade Li2CO3 at Sonora, the company’s main project in Northern Mexico. Pre-tax IRR is estimated at 29% (25% post tax). 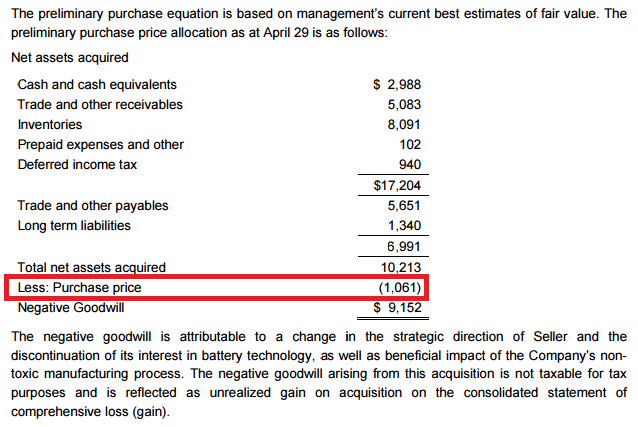 Associated NPV accounts for $776 million (8% discount rate). 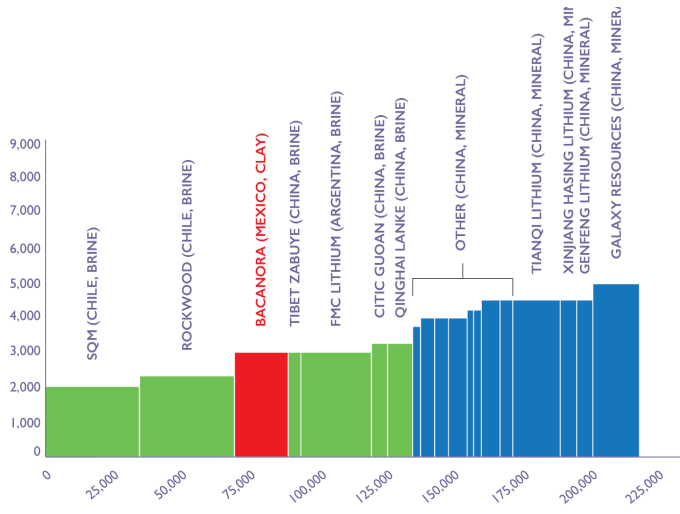 With an Indicated Mineral Resource estimate of 5 Mt of LCE and an Inferred Mineral Resource of 3.9 Mt of LCE, Sonora might be one of the world’s largest clay lithium deposits. The project site is approximately 170 km south of the U.S.-Mexico border. The next key step in the development of Sonora is a Feasibility Study, which is fully funded and expected to be completed in Q1 2017. 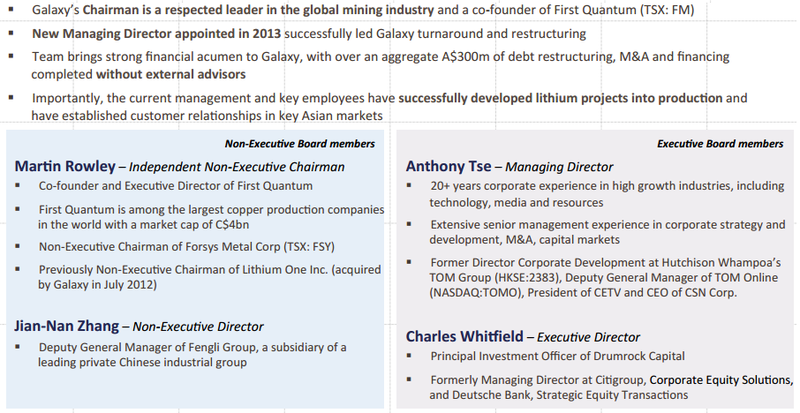 Peter Secker, the company’s current CEO, has previously worked as the CEO of Canada Lithium (9/2009-12/2013). With the potential of becoming the only significant lithium producer in North America, the company was acquired by RB Energy (OTCPK:RBEIF) in the beginning of 2014. In October, after experiencing a strong winter that resulted in delays and infrastructure procession issues, RB Energy failed to obtain the required financing and applied for creditor protection. While working at Canada Lithium, Mr. Secker might have been too optimistic on his company back in 2012. The company states that its production costs are going to be quite competitive. An important risk to consider comes from Mexican corporate laws. According to the company’s latest financial statement: “The Company has generated accumulated losses of $6,567,446 and the shareholders’ equity of two of the Company’s subsidiaries incorporated in Mexico have decreased to an amount less than one third of their share capital which, according to Mexican laws, may be a cause for dissolving a company at the request of any interested third party. If the Company is not able to generate income producing transactions through the identification and exploitation of ores, and continues to raise sufficient capital to continue exploration activities, there is a risk that the rights to the mining concessions could be challenged.” In addition, management fees, which accounted for only $129,827 in Q4 2014, have reached $357,161 by Q4 2015. For its size, the company has a significant number of large shareholders. On August 28, 2015, the company, together with its partner and major shareholder Rare Earth Minerals, has entered into a lithium supply agreement with Tesla Motors. The deal will last for five years starting from the first order, with an option to extend the contract for another five years. Stocks with exposure to lithium are not entirely limited to mining companies, however. 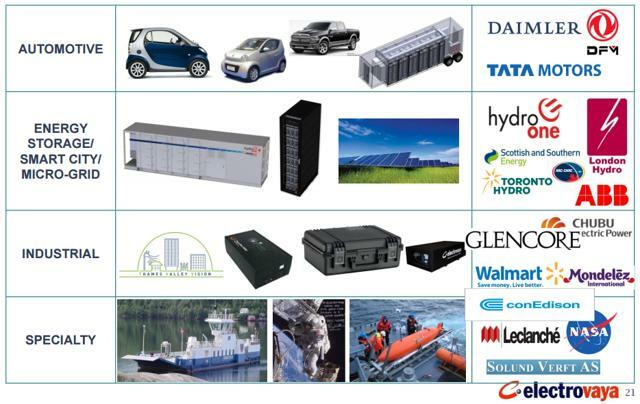 Production of lithium-ion batteries, battery systems and battery-related products for the clean transportation, smart grid power, consumer and healthcare markets. With the main facilities in Kamenz, Germany, the company produces a wide variety of products. Of note is the company’s ability to expand in different markets globally. The company’s website is full of new deal announcements in various industries, which has certainly had an impact on its profitability of late. The company has been reasonably successful in striking deals in the EV market. The figure below is a snapshot of its latest announcements in the field of passenger vehicles. On March 3, 2014, the company has announced that Ralph E. Lean has joined the board of directors. Mr. Lean is a well-known business lawyer, who, according to National Post, might be among the most influential business people of Canada due to a quite extensive contact network and experience (short biography: 1, 2). Even though the company’s management consists of a well-picked team of professionals from different industries and may indeed be the “exceptional team of engineers, scientists, sales and support individuals” as the company claims it to be, it is important to mention that it consists of four founding family members. Raj Das Gupta, Ph.D., who is currently the VP of Business Development (and has previously worked as Director of Research and VP of Energy Storage) did not sound too convincing for a person responsible for “managing and increasing Electrovaya’s sales for both its stationary and automotive energy storage systems, as well as developing Electrovaya’s strategy for technology licensing and business partnerships” during this speech four years ago. On March 18, 2014, the company announced its intentions of joining the Canadian Trade Mission to Germany led by the prime minister later that month. The company has received notable support from the government before; for the primary focus on sustainability of the company’s operations, it was awarded $3.2 and $5 million by the government in 2013 and 2009, respectively. 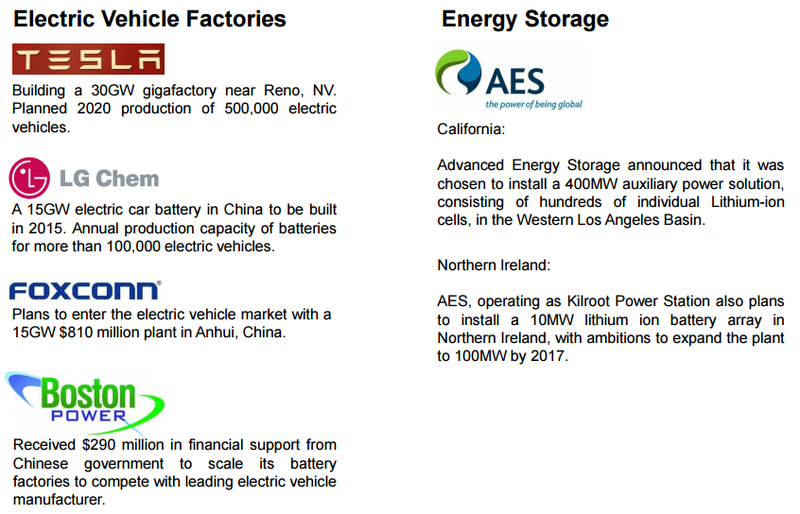 In November 2014, the company announced plans of acquiring a “state-of-the-art manufacturing plant with capacity of about 0.5 Gigawatt hours (GWh) of lithium ion electrodes and other products.” The completion of this transformative acquisition was announced on April 29, 2015: “This is a transformational acquisition for Electrovaya as it instantly brings best-in-class manufacturing, and capacity to meet exciting growth prospects for the company’s energy storage and other products.” This was true, as the acquisition finally ended the company’s long-lasting earnings struggle. Despite the strong revenue performance and new deal announcement rate, the company was mostly unprofitable (non-IFRS profits have been used in the earnings announcements for years) prior to the acquisition. “Separion is a proprietary ceramic composite separator for ultra-safe lithium ion battery applications. The acquisition includes an exclusive license to distribute as well as the ability to sub-license, form joint ventures, expand production within Germany, and establish additional plants in Asia and elsewhere (…) Acquiring a large portfolio of intellectual property in Litarion including patent assets which relate to electrodes, electrolytes and lithium ion battery cells.”The company expected higher margins and broader markets. Q3 2015 revenue of $6 million demonstrated a 900% quarterly growth. Q4 2015 and Q1 2016 demonstrated two consecutive profitable quarters with net profits totaling $1.338 and $2.959 million, respectively. It is hard to deny that the company received a quite good price tag for the acquisition. As of the latest filing, the company’s current liabilities were almost four times larger than its cash position, which stood at $3.26 million as of December 31, 2015. However, its cash position is not that bad in reality. Current liabilities increased after the acquisition of Litarion, as the company issued promissory notes (8.25% per annum, maturing on February 11, 2016) and a shareholder loan accounting for $1.203 million (issued on April 21, 2015; 10% interest with a repayment term of 18 months). Speaking of the notes, “the parties have agreed to renew for a further 12 months maximum period under the same terms and extension of the warrants or issue of new warrants for a 24 months period,” according to the company’s statement. Meanwhile, long-term liabilities accounted for only $734,000. Red flags might include rising inventories ($9.76 million as of the latest filing – 29.22% q-o-q) and, arguably, quite frequent typos (which can be seen in the last sentence of the screenshot above) in financial statements and on the company’s website. Firstly, emerging exploration companies often have no production and thus require constant cash inflows in order to cover the cash burn. Therefore, the companies primarily have two options: to issue either more debt or more shares. What usually follows is the continuous balance sheet deterioration andshare dilution, which I perceive to be the main reason why it might be too early to allocate a material part of the portfolio in lithium stocks. Sometimes, companies are just being cut from both sources of additional capital. It is important to note that RB Energy was actually in a quite good shape just before it turned incapable of funding its operations. Secondly, many small, early-stage lithium companies are in danger of realizing that their production is uneconomic at some point in the future. And on the contrary, decent projects might experience shutdowns should the company experience liquidity issues which are more likely to happen if the markets enter a major correction. Thirdly, emerging producers are more strongly exposed to geopolitical and natural disaster risks as they are simply too small and are not capable of sufficiently diversifying their project portfolio. The fourth risk factor comes from the very nature of the industry and it is by no means related to lithium. Even though the industry is not exceptionally profitable yet, it is succeeding in creating both investment and fraud opportunities. Skepticism should be of paramount importance when reviewing these companies’ announcements and statements. As all players, including the good, the bad and the ugly, need capital to invest in their projects; it might be difficult to distinguish between the real growth opportunities and duds as allcompanies are to some extent playing on investors’ emotion strings to get the demanded financing. Finally, these stocks represent a level of volatility that might be difficult to handle for most of the investors, which is another reason why I’m planning to focus on discovering companies possessing the most attractive risk/reward relations. All of the stocks described (with the lone exception of Galaxy Resources) are small caps, which makes them strongly vulnerable to any market fluctuations. John Petersen on demand and supply risks for cobalt, lithium and graphite in the lithium-Ion battery industry. Christopher Ecclestone on Tesla’s supply chain. Mineweb’s interview with a lithium industry consultant Joe Lowry of Global Lithium LLC. Latest (dated March 17, 2016) Mineweb’s interview with Joe Lowry that provides additional insight on lithium supply and pricing, Tesla’s Gigafactory and additional catalysts. Mining Weekly urges lithium investors to maintain caution. 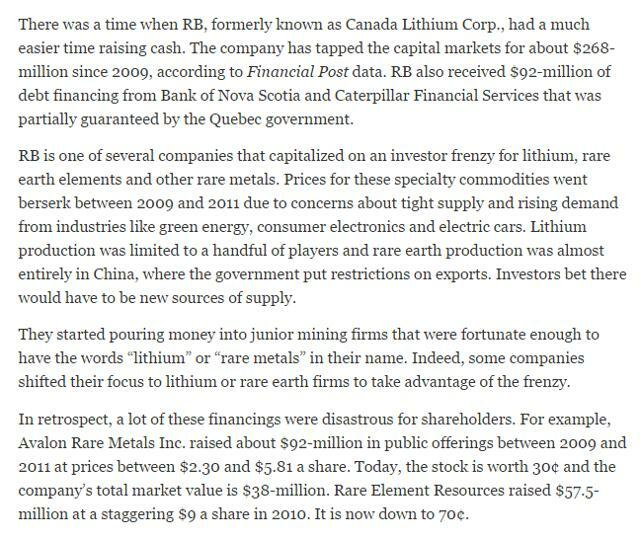 The before-mentioned article on RB Energy from Financial Post. Nonetheless, only fools rush in. Despite potentially being a part of the booming industry, lithium-exposed stocks are subject to the major market movements. Being no exception, they are going to underperform (at least relative to the current expectations) should the stocks enter a strong bear market. After a severe correction, the industry might get quite cheap relative to its potential and offer an attractive risk/reward. The competition is not strong enough to drive an oversupply of the metal, which is crucial. On the contrary, should the ambitious plans of Tesla create a lithium supply shortage, the industrial metal might start shining. What is of paramount importance in this trade is timing. Even though it is arguably not the best moment to obtain exposure to the industry as most lithium-exposed stocks are small- or even nano-caps and might experience drastic price swings should the market correction start once again, this knowledge might prove to be of high value when the related stocks get cheaper. At the time being, however, particular stocks might demonstrate a quite low correlation with the broad market moves (which by no means makes them less risky though). The lithium industry will experience it all: there will be bankruptcies, there will be losers, and there will be winners who will get both the profits and the assets of the losers. Even though it might be tempting to dedicate a marginal part of the portfolio to lithium exposure, it requires a great deal of cautiousness to proceed. At the same time, the returns of the stocks described above clearly demonstrate that on average lithium rewards the speculators. It would be reasonable to proceed with either constructing a well-diversified portfolio or select the least risky yet high growth potential bearing stocks. In the next parts of the series, I am planning to elaborate on both options.